Each block is equipped with three banks of lifts serving four condominiums per floor in Block A and five condominiums in Block B. Each unit comes with two covered car parking bays. 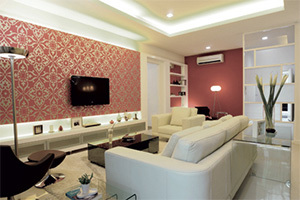 The orientation of both towers provide residents with a sweeping view of Petaling Jaya and Shah Alam. Definitely an added bonus is the view from the balconies of the spectacular fireworks displays at the stroke of midnight every New Year’s eve, courtesy of The Curve and One Utama! 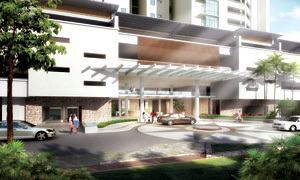 SITUATED ON AN 8 ACRE SITE, SURIAN RESIDENCES WHICH COMPRISES 311 CONDOMINIUM UNITS IS A LOW-DENSITY DEVELOPMENT OF TWO TOWER BLOCKS OF 25-STOREYS AND 23-STOREYS. THE STAGGERED CONFIGURATION GIVES THE DEVELOPMENT A STRIKING PROFILE. THERE ARE LITTLE TOUCHES OF LUXURY THROUGHOUT EACH CONDOMINIUM. Surian Residences offers a choice of 35 floor layouts with built-ups ranging from 850 sq ft to 2,443 sq ft to cater to different lifestyle requirements. 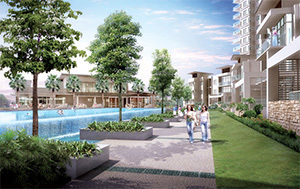 The ground floor units include private gardens with a view of the swimming pool. Every unit is distinguished by some signature features. Most significant are the 10.5 feet high ceilings, eight feet high interior doors, wide balconies and oversized windows which enhance the feeling of spaciousness. There are little touches of luxury throughout each condominium. For instance, the bathrooms are fitted with tempered glass shower screens and granite vanity tops with semi-recessed washbasins. Standard fixtures include 3-phase electricity supply, air-conditioning points to the living, dining and main bedrooms, and water heaters to all main bathrooms. In addition, air-conditioning units will be provided as well as a washer and dryer set for each condominium. EVERY UNIT IS DISTINGUISHED BY SOME SIGNATURE FEATURES. Surian Residences offers an extensive range of recreational facilities for the enjoyment of its residents. A clubhouse which is centrally located accommodates a fully-equipped gymnasium, two indoor badminton and volleyball courts, in a multi-fuction hall. Without doubt, many activities will be centered at the pool area which includes a 32-metre lap and lounge pool, and a wading pool apart from the barbeque station, children’s playground and jogging track. Outdoor sports include tennis and basketball with the courts strategically located across the clubhouse. Internet broadband connectivity and connection to a master ASTRO antenna are a standard feature. Residents will enjoy the convenience of shopping, dining, entertainment and relaxing either at the Curve, e@Curve, the Royale Bintang Damansara Hotel, IKEA, IKANO Power Centre, TESCO Hypermarket and Courts Megastore which are located within minutes of Surian Residences. Surian Residences is specifically designed to harvest rain water from its roofs for storage in a specially designed water tank. This water can then be used to aerate the landscaped greens surrounding the condominiums. Energy saving bulbs will be a standard specification for all common area lightings and Recycle corners will be created within the common areas for the residents. AT SURIAN RESIDENCES, THE SAFETY AND SECURITY OF RESIDENTS IS PARAMOUNT. Every effort has been made to ensure security measures taken are both effective and unobtrusive. These include 24-hour security patrolling, smart access card, CCTV, an intercom system linking the condominium unit with the control room and strategically located panic buttons in every unit.